There has been a lot of discussion already about the future of Epcot in Walt Disney World, following announcements made during D23 Expo, in Anaheim earlier this month. Let's look at exactly what Bob Chapek and Tom Fitzgerald said about that park during the Parks and Resorts presentation. Now, some of you may have been there when I said, "Teams are thinking big when it comes to Epcot." Today we will give you a peak at some of what we are doing, so you can imagine just how big we're thinking. Now, our work on the park is centered around a few guiding principles: we want to keep it true to the original vision, while making it more timeless, more relevant, more relevant, and more Disney. We're also insuring that these plans incorporate what we've been hearing from our guests, especially from our families with young children. They love Epcot, but they wanted to have a little bit more of that Disney, "wow factor." And, that's why we asked an Imagineer who worked on the original plans for Epcot to now lead the teams at updating it. Many of you may recognize him from his role in Horizons, and he's earned a distinction reserved for very few, meeting his own animatronic. Please join me in welcoming, Tom Fitzgerald. Thanks for joining me here, Tom. We've got a great crowd here. Happy to be here, Bob, although I have to say I still wish I looked like one of those two guys in the picture. I don't think you've changed a bit. You look just the same. 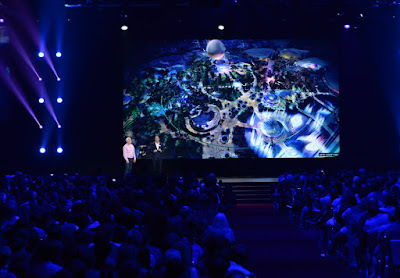 All right, so it's been about six months since we first hinted at our big plans for Epcot, and before we share some news about what's coming, Tom, I'd like to ask to ask you a little bit about how we're approaching this work, because Epcot means so much to all of our fans. Sure. Well, Epcot has always been, from day one, an optimistic celebration of the real world, brought to life through the magic of Disney. It's really kind of a living showcase to the world we have created and the world we continue to create together. It's a place where the real becomes fantastic, and the fantastic becomes real. And, while Epcot gets ready to celebrate, believe it or not, it's 35th Anniversary, in Florida, in Glendale, our Imagineering team is busy at work planning for Epcot's future. And, what a future we have in store. I mean, that's especially true when you consider World Showcase. It's a really special place, where guests of all ages can experience the cultures from around the world in a global community, and guests love it. And, it's no surprise that these beautiful countries, and their histories, have inspired many of Disney's most beloved films. You all know that Norway serves as the inspiration for Disney's animated hit film, Frozen. And, last year we opened Frozen Ever After at our Norway pavilion. My colleague, Kathy Mangum, who is somewhere in the house, and her team did an incredible job, and it is a huge hit with our guests. You know, Tom, in fact, they love it so much, they are requesting more FastPasses for that attraction than any other attraction in Epcot. And, we want to build on that success, so that World Showcase celebrates both real countries and the world's they inspire. So, I'm thrilled to announce we'll be adding a brand new attraction, Ratatouille, to the France pavilion. We're going to add it to an entirely new area, right past the Eiffel Tower. It's going to be patterned after our popular attraction at Disneyland Paris. Guest are going to shrink down to the size of Remy, and join him on a crazy race throughout the kitchen and Gusteau's restaurant. Ratatouille is already the number one attraction at Disneyland Paris, and we really think it's going to be a great addition to Epcot. Agreed. And, we're also looking at enhancing some of our existing attractions. For example, we're creating a brand new film for the China pavilion, and we're doing it with some new technology. We all know that Walt Disney was a master at innovating, and throughout his career he created so many different storytelling and motion picture firsts. One of his favorites was CircleVision 360, which debuted here at Disneyland, and it's been a staple at World Showcase in Epcot since its beginning. Well, now, taking a cue from Walt, and the original CircleVision, we're creating a next generation digital camera system, much as we did for Soarin', and we're gonna be taking this rig on the road to film our very first seamless CircleVision show for the China pavilion. So, I promise you, this is just a glimpse of what we have planned for World Showcase. So, stay tuned, because there's much more to come. And, as you all know, there's a whole other part of this park, too. This evolution is designed to stay true to the DNA of Epcot, particularly those ideals of optimism, and hope, and awe and wonder of our world. And, as this blue sky artist concept drawing shows, we also have big plans for the front of Epcot. Now, it's going to continue to build on Epcot's celebration of creativity and ingenuity. That's right. Epcot is a reassurance that we are part of something great. If we can dream it, we can do it. And, Epcot has always been a place where the real becomes fantastic, where you can train to be an astronaut or you can travel beneath the seas, but it's always become a place where the fantastic becomes real. For example, talking to a Sea Turtle, named Crush or Soarin Around the World, in four and a half minutes, but now that fantastic is about to become real, in a whole new way. That's because we're thrilled to announce today that Epcot will soon have a brand new, e-ticket attraction, based on the rockin', action-packed world of Guardians of the Galaxy. We think this epitomizes our goals for Epcot in a way that stays true to the original ideals. It's also more timeless, more relevant, more family, more Disney. And, it will really give fans that sense of "wow" that they've come to expect from Disney. So, the Guardians are going to take our guests on an out of this world adventure, but it will still be very rooted in an Epcot story. In fact, the reason that the Guardians have come to Epcot in the first place is that a young Peter Quill, actually visited Epcot as a kid. . . . . proof. Who knew? So, Tom, how in the world did you get that photo? Rocket stole it from the Guardian. That collector. Of course he did. So, guests at Disney California Adventure already love stepping into the worlds of the Guardians of the Galaxy, and we're excited to give guests in Florida a chance to experience this world in a new way. Now, the teams that are working on all of this and more, in time for the opening of Walt Disney World's 50th Anniversary. Now, work of this magnitude, obviously is going to take some time, but in the meantime, Tom, tell them what's in store for guests starting this summer. Okay. Next month we'll be re-opening Mission: Space, and when we do, we're adding a brand new mission to join the already popular Orange mission. Our partners at ILM have worked their magic on making the Mars mission look even more incredible, but wait 'till you see what we've created with them for the all-new Green mission. Guests are going to blast-off for an orbital adventure around our planet, and as you can see in some of these clips, it's kinda like soarin' around earth. And, with this Green mission, what's really great is that younger kids can join the adventure for the very first time. And, this is just one more example of how we're looking to enhance what we already love about Epcot, and following one of our guiding principles to give families even more opportunities to enjoy the park together. Tom, we've got some other extraordinary plans. What else would you like to share with our fans? Oh, there's a lot I'd love to share with you today, but I'll save that for the next time. I'll tell you one more thing. We all know that guests love dining at Epcot. It's one of the real keys of Epcot, and the restaurants there really are out of this world, but now we're about to create one that takes that literally. Adjacent to Mission: Space, will be a brand-new table-service restaurant that will invite you to travel high about the earth, where you'll enjoy great meals, and an even greater view. That's fantastic, Tom. I know all of us are wondering where we might see your next animatronic head. Well, I don't know where . . . gonna be, but from the looks of this and everything else we have on board I think I'll be spending a lot of time in Epcot.